Congratulations! - you've just found the home of the most complete and comprehensive resource for the Polish P-64 pistol. This site is always a work in progress, and comments are always welcomed. Enjoy your stay and don't forget to register on the forum. 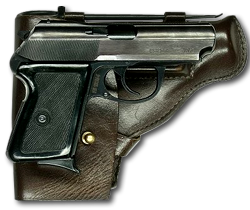 Welcome to the one stop web site dedicated and devoted only to the Polish P-64 pistol. This site was originally created on October 24, 2005, and has since seen a massive explosion of popularity. With the price of this pistol averaging somwhere in the $150 US range, its accuracy rivaling high end tuned pistols, and its size and weight making it perfect for concealed carry, it's no wonder this little gem is so popular. First and foremost, let's get the most discussed topic out of the way. THIS GUN IS NOT A MAKAROV. It does, however, use the 9x18mm, or, 9mm Makarov cartridge. The left side of the slide has factory rollmarks of 9mm „P-64”. Because the West knows the 9mm as the 9x19, importers added "Cal. Makarov" and "x18" in electropencil to indicate it's difference. The Polish P-64 and Makarov simply share their caliber - nothing else. DO NOT fire any other 9mm round (9x19, 9x17, etc.) in the P-64! The P-64, if anything, is more of a clone of the Walther PPK. Both have their strong points and weak points . Some folks say the 'real' Maks are better than the P-64's. Others disagree. Whatever side your on, the only thing that is a fact is that they are not the same weapon and only share their caliber. The P-64 was designed during the late fifties by a team of Polish army officers. The team developed two different prototypes called CZAK (acronym of designer's last names): model M (milicyjny - police model) and model W (wojskowy - military model). The two models differed in magazine capacity and external dimensions (the military model had longer barrel and 7-round magazine). In 1961 CZAK model M was chosen to replace the Russian Tokarev TT-33 pistol as the standard service pistol of the Polish military, police and government security agencies. Production started in the middle sixties under the official designation "9 mm pistolet wz. 1964" (9 mm pistol model 1964). 1972 saw introduction of minor changes to the trigger mechanism and shape of the hammer (larger hammer spur). Users of the P-64 had pointed out a series of shortcomings: unpleasant recoil due to small and uncomfortable grip, small magazine capacity, poor sights, short sight radius and heavy double-action trigger. Work to correct these problems started in early seventies and resulted in a series of prototypes (P-70, P-75, P-78A, P-78B). Eventually P-83 (production version of P-78B) was adopted as replacement for the P-64. The P-64 is a blowback operated, double-action pistol. Although designed from scratch by Polish engineers, the P-64 is very similar to German Walther PPK and is sometimes described erroneous in western literature as it's clone. Frame and slide are made of steel and the finish is blue. The barrel is fixed to the frame with the recoil spring wound around it. The controls consist of a slide mounted safety lever and a magazine catch. The safety lever has two positions: up for "fire" and down for "safe" and decocks the hammer (if cocked) when put on safe. The safety mechanism allows the slide to be operated with safety on. Unlike the Walther, the P-64's magazine release is located at the bottom of the frame, slowing down the reloading process. The single-column magazines hold 6 rounds. The slides locks back when the last round from the magazine is fired but there is no external slide release. Double-action trigger pull is heavy: 110-120 N (25-27 lb). The sights are fixed and set at a rather exaggerated distance of 50 meters. A loaded-chamber indicator is located in the rear part of the slide, just above the hammer. Grips are checkered black plastic. The gun is field stripped by swinging down the hinged trigger guard. The slide is then pulled rearward, upward and removed from the frame. Holster with magazine pouchP-64 is a rather compact sidearm; measuring 160 mm long and 117 mm high and weighting 678 g when loaded, it is just slightly larger and heavier than the PPK but it fires a more potent round. P-64 is one of the most compact 9 mm Makarov pistols made. It's carried in a leather flap holster equipped with a side pocked for a spare magazine and a cleaning rod. A leather shoulder holster was also issued. Fully loaded with a loaded spare magazine, standard service holster and cleaning gear it weights just 930 g (32.8 oz).